Are you looking to find a few platforms to get started? Perhaps these will help Also do not forget to check out PR on Behrman as another option. 1. AspireIQ (formerly Revfluence) The Details credited as seen on this site. Though an influencer needs to have an account on the platform in order to participate in campaigns, the database of influencers isn’t restricted to those who’ve opted in. There are over 500,000 profiles to search through, all found by the software’s underlying algorithm. It crawls the web gathering massive amounts of data on social accounts, and the best ones filter through and get added to the platform. AspireIQ’s influencer discovery module has undergone enhancements, most notably with the way they give customers a variety of ways to find the right influencers. There is, of course, a straight ahead search engine, where you can search for keywords, hashtags, topics, etc., and then filter the results down by specifying follower counts, average likes per post, and other demographic info (for the influencers and their audiences). But finding influencers isn’t restricted just to searching for them. There are other methods AspireIQ uses so that you can truly discover someone you might not have otherwise seen. 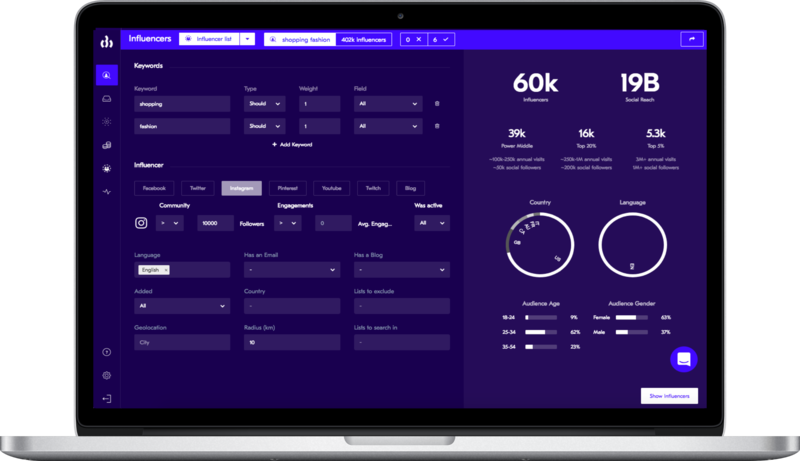 Upfluence provides the leading influencer marketing tools to help you select your influencers and manage & analyze your influencer campaign performance at scale. 4. Brands use Mavrck to harness the power of influence marketing at scale. Our patented, all-in-one influencer marketing platform empowers brands to discover and activate thousands of their most impactful influencers, advocates, referrers, and loyalists to create ideas, insights, and content across touchpoints. Traackr provides one system-of-record for influencer discovery, management and analytics to scale the impact of influencer relationships across your organization. has the most sophisticated influencer search engine out there. 7. OBVIOUSLY offers innovative marketing packages, developing unique campaigns specially tailored to your brand’s needs. And they take care of it all! With over 400,000 influencers in the database, across all major channels, they can handle programs of any size or complexity.